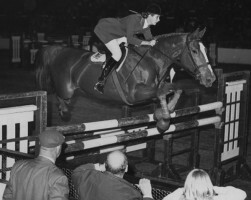 Mary Mairs Chapot won the Grand Prix of New York International Jumping Class at the National Horse Show (N.Y.) in 1966. A couple of weeks ago, I gracefully parted ways with my mount while out foxhunting. I walked away hardly worse for the wear, less the pain of having to take flack from most of the men in the hunt. Whether my argument of not riding in my own tack, or having a headache, or ducking to avoid a branch were viable (but also pathetic) excuses, maybe the real problem was that I had sacrificed my seat, as was the male consensus—and as we all know, once that goes, so do you. While working on various projects this past week, I ran into several articles referring to the classic riding style of the 1960s. Denny Emerson speaks to it often in his column. And then I found a photo of Mary Mairs Chapot, who was a member of 22 Nations Cup teams and rode as the first woman (with Kathy Kusner) to represent the United States in Olympic show jumping in 1964. And she looked picture-perfect doing it. Representing the United States internationally, Chapot and her chestnut mare, Tomboy, were double-gold medal winners at the 1963 Pan American Games in Sao Paulo, Brazil. She was the first U.S. rider to win an individual show jumping gold medal at those games. She went on to win the grand prix at the National Horse Show (N.Y.) twice, in 1966 and 1968. In 1967, Chapot also was a member of the silver-medal-winning team at the Pan American Games in Winnipeg, Canada, this time with the horse White Lightning. In England, they captured the 1968 Queen Elizabeth II Cup at the Royal International Horse Show in Hickstead. Her presence made history on the 1964 Olympic team in Tokyo, Japan, which placed sixth. With Kusner, they were the first women to ride on a U.S. Olympic show jumping team. Carol Hagerman Durand qualified for the 1952 Olympic Games, but was prohibited from being a part of the team. Dressage rider Marjorie Haines was permitted to ride that year in Helsinki, Finland, and placed 17th individually. Marrying her teammate, Frank Chapot, in 1965 did nothing to slow her down. On July 25, 1965, she edged her husband out to win the first show jumping grand prix in North America, the Cleveland Grand Prix (Ohio). The couple rode together in the 1968 Olympic Games in Mexico City, Mexico, when the team finished fourth overall. Upon retiring from competition, Chapot dedicated herself to the success of her daughters’ riding careers. Wendy, the oldest, acts as an official at horse shows and rides as an amateur. Her daughter, Laura, who was named the 1995 AHSA Rookie of the Year, is a professional show jumper and operates Chado Farms with her parents. Laura’s career took off with the Chapot’s famed horse, Gem Twist. Since then, her mother has coached her to represent the United States internationally. In 1992, Mary was inducted into the Show Jumping Hall of Fame. She is still a familiar face on the hunter/jumper circuit, often judging high-profile competitions. Mary and Frank split their time between Neshanic Station, N.J., and Wellington, Fla. In a Chronicle interview, fellow equitation icon George Morris summed up Chapot’s career. Meghan Blackburn likes figuring out how we’ve all ended up where we are. And studying the history of the horse industry offers up plenty of answers. Whether it’s pilfering through countless vintage Chronicle issues in the attic, or propping her feet up to pore over one of the bound volumes which are piling up on her desk, she’s committed to getting the dirt on those who have helped the evolution of the equine world and blogging about it weekly. Have questions or suggestions? Email Meghan at webintern@chronofhorse.com.